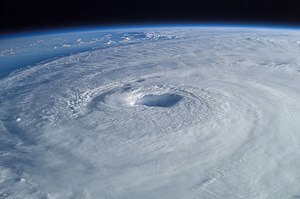 Hurricane Isabel (2003) as seen from orbit during Expedition 7 of the International Space Station. The eye, eyewall and surrounding rainbands characteristic of tropical cyclones are clearly visible in this view from space. Ìjìláyípo Ilẹ̀-Olóoru tabi Ìjì Ilẹ̀-Olóoru (tropical cyclone tabi tropical storm) je iru iji ti arin re ni itemo rirele gbangba center ati opolopo awon iji ara ti won mu afefe lile ati ojo kikan wa. Awon ijilayipo ile-olooru n wa nitori igbona to n sele nigbati afefe rírin ba gberasoke, lati fa isupo omi oru to wa ninu afefe ririn. Àtunṣe ojúewé yi gbẹ̀yìn wáyé ni ọjọ́ 9 Oṣù Kẹta 2013, ni ago 10:38.